This event is informal, friendly and supportive. No need to book in advance or prepare anything just turn up on the day with a smile, your business cards and look forward to meeting lots of other business women. A friendly welcome is offered to all.Informal Networking over coffee on the first Friday of the month all year round. All business women are invited so whether you a networking novice and or nifty networker, come for an hour or the full two hours and see if we can help you build your business with new connections and inspiration. 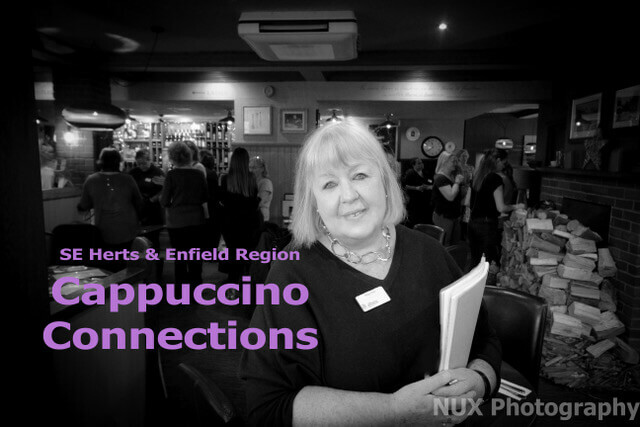 For ladies who haven’t visited an Athena group and experienced an Athena structured business meeting, Cappuccino Connections is a great ice breaker, ideal for anyone new to Athena and/or to networking. There is a £5 meeting fee for visitors (who are restricted to one visit to our informal Cappuccino Connections and one visit to a formal business meeting before we ask you to commit to joining our network) the event is free for Athena members, (you pay for your favourite beverage separately), no structure, turn up at any time between 10 and 12 noon, please feel free to spread the word.